Little ones are born with a sweet tooth, so it’s a good idea to introduce them to the other side of the taste spectrum—and early on. Paella is the perfect introduction, with its savoury subtleties and variety of spice flavours. Try out this simplified version for your budding gourmand—and the whole family!—tonight. Pour rice into a medium-sized pot, add stock, turmeric, veg oil, and saffron. Stir well. Bring mixture to the boil, then cover and simmer for around 10 minutes. Next, drizzle the olive oil in a pan, and tumble in the vegetables, scrape in the garlic, and sprinkle over the seasoning. Stir-fry until tender (approx 5 mins). When rice is done, add to the veggies and combine, coating with the flavours from the frying pan. 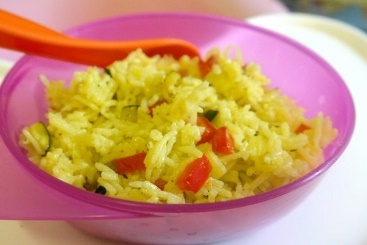 Recipe from Easy Indian SuperMeals for Babies, Toddlers, and the Family.